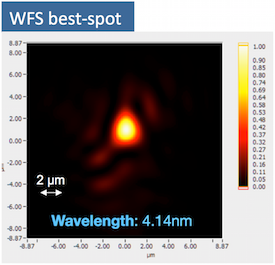 FERMI is a single-pass FEL user-facility covering the wavelength range from 100 nm to 4 nm (in the first harmonic), located next to the third-generation synchrotron radiation facility Elettra in Trieste, Italy. The implemented seeded FEL scheme guarantees the generation of highly transverse and longitudinal coherent pulses, and the use of APPLE II-type undulators allows for variable polarization, from completely linear both horizontal and vertical to circular in both directions. These unique features call for a dedicated diagnostic section capable of providing photon beam informations to the users. 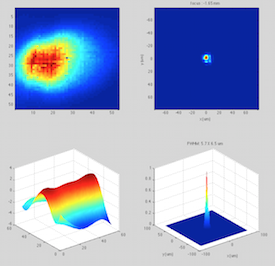 PADReS, which stands for Photon Analysis Delivery and REduction System, is the section of FERMI@Elettra devoted to characterize, manipulate and deliver the photon beam to the endstations located in the experimental hall. This section is located after the undulators of both FEL lines, and before the final four endstations in the FERMI experimental hall. PADReS gives informations about several parameters like intensity, spectral distribution, position, and coherence. Some of them are resolved pulse by pulse and are obtained in a non-invasive way (intensity, spectral distribution, position), while others (coherence, for instance) can be measured only invasively. A gas absorber, moreover, gives the user the possibility to reduce the photon beam intensity by up to four orders of magnitude. PADReS includes also split-delay and focusing systems. 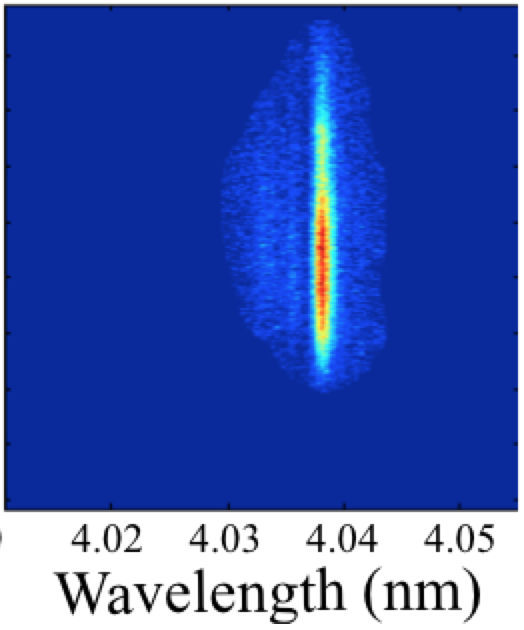 PRESTO, the Pulse Resolved Energy Spectrometer: Transparent and Online, is fully operative and has supported basically all the activities involving the use of FEL light. In particular, it represents the most important diagnostic tool available along PADReS, giving detailed information about the entire spectral content of each single FEL pulse delivered to the endstations. EIS-TIMER is the beamline dedicated to four-wave mixing techniques, including the creation of transient gratings on the sample surface. After the installation and commissioning, first experimental results are starting to be collected at the endstation. KAOS, the Kirkpatrick-Baez Active Optics System, serves as a refocusing section for three beamlines at FERMI (DiProI, LDM and MagneDYN), and is going to be used also at FLASH2 facility in Hamburg. The system is capable of providing variable-size focal spots into the endstations assuring the fine correction of the wavefront incoming on the sample. Recently, it was upgraded mechanically in order to guarantee opto-mechanically limited focusing to the experiments. PADReS, the FERMI Photon Analysis, Delivery and REduction System is fully operative and has supported the activities of both the machine commissioning and the experimental users program. As it determines and monitors several properties of the FEL photon beam, it represents an invaluable and unique resource to optimize the FEL emission and to characterize shot-to-shot the radiation used during the experiments carried out in the endstations. A Kirkpatrick-Baez Active Optics System (KAOS) has been installed at FLASH2 recently. It is supposed to collect the FEL radiation and focus it onto the sample in the endstation. The focusing is realized keeping the wavefront as flat as possible (monitored by a wavefront sensor) by means of the active benders acting on the mirror substrates. In this way, the ultimate spot size approaches the opto-mechanical limit of the system. 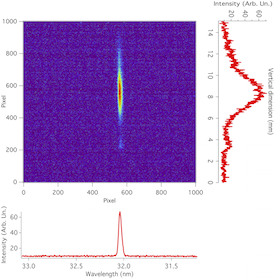 The Pulse-Resolved Energy Spectrometer (Transparent and Online) is now fully commissioned and calibrated. 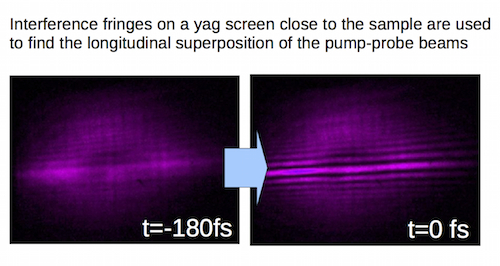 It works with both FELs, measuring online and shot-to-shot the spectral content of each pulse in the 100-4nm range achieved by FERMI so far (in the fundamental harmonic). It is endowed with three diffraction gratings: the Low Energy (LE) one covering 100-24nm, the High Energy (HE) one covering 27-6.7nm, and the Super High Energy (SHE) one covering 12-3.2nm (all of them using the first order of diffraction). The gratings deliver most of the radiation in 0-order to the endstations (>97%), though simultaneously allowing the determination of the photon beam spectral characteristics (working on the diffracted beam). 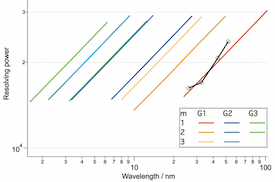 Up to the third diffraction order can be used in case of need, especially to extend the measuring range and to determine absolutely the wavelength in use. NEWS: the new diffraction grating (Super High Energy - SHE) has been successfully commissioned. This grating covers the 3.2-12nm range with increased efficiency with respect to the HE grating, allowing a better characterization and optimization of the machine in view of the opening of FEL-2 to external users in 2016. The Kirkpatrick-Baez Active Optics System serving DiProI and LDM endstations have been tested and developed continuously between 2012 and 2014 using both FEL-1 and FEL-2. 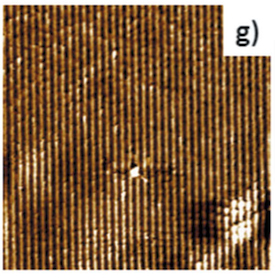 After several experimental shifts dedicated to the characterization of such systems (namely, Kirkpatrick - Baez refocusing sections using thin plane mirrors that are mechanically bent to achieve the desired shape), the performances in terms of spot sizes and shapes have almost reached their nominal opto-mechanical limits. 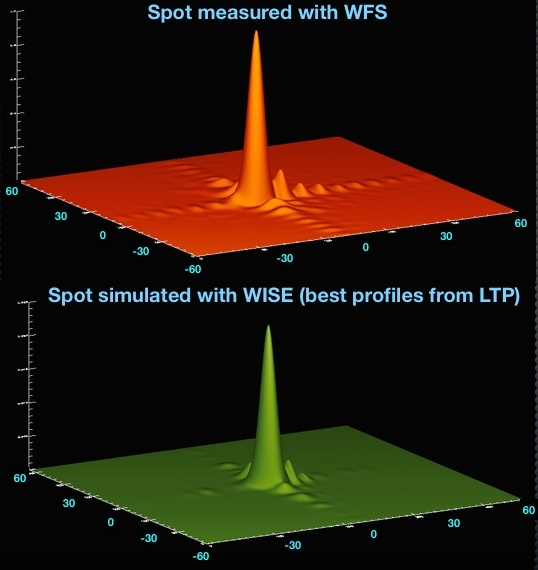 Spots as small as 5x8µm2 have been obtained, taking advantage of the use of several diagnostics like wavefront sensors, YAG and phosphor screens, and damage on PMMA and silicon substrates. These systems have been successfully used throughout the external users' experiments, and have demonstrated their flexibility in focusing radiation from both the FELs, as well as focusing radiation in experimental chambers mounted after the endstations of FERMI. The AutoCorrelator/Delay-Creator is an EUV/SXR autocorrelator designed to wavefront-split the incoming beam, retard one of the half-beams with respect to the other, and then recombine them creating a double pulse with controllable time separation. The Δt ranges from -2 to ~30ps in standard conditions and for all the wavelengths delivered by the machine. For selected wavelengths the Δt can be increased up to 1.3ns. The AC/DC is located in the experimental hall, on the common optical path carrying the photon beam to the EIS-TIMEX, DiProI and LDM endstations. It is in the commissioning phase and has already demostrated to be effective in splitting and recombining the FEL beam, letting the first pulse duration measurements be carried out on LDM. May 2017: Goodbye to Cristian Svetina, and all the best for his new PSI adventure! 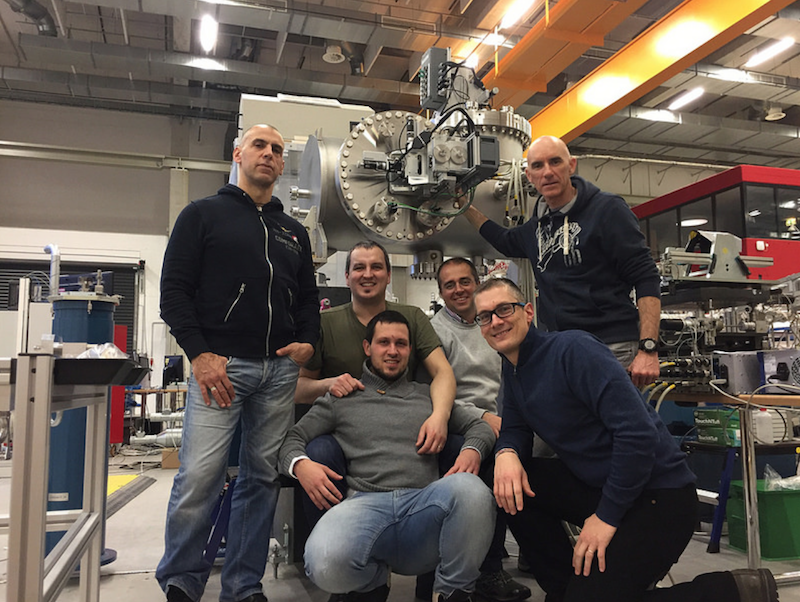 April 2017: EIS-TIMER beamline received the first external users! February 2017: The KAOS@FLASH was installed and is under commissioning. December 2016: New DiProI K-B system commissioned: 1.8x3 µm2 spot at 4.14nm! August 2016: The first optical element of MagneDYN (PM2a_MD) was installed! October 2015: Elettra is now a partner of the EUCALL European project. PADReS in involved in WP7 - PUCCA. July 2015: Elettra-DESY collaboration for a KAOS system to be installed at FLASH. Different people have contributed and still contribute to the realization, commissioning and functioning of PADReS. The system benefits from team's know-how in several fields like: x-ray geometrical and physical optics, metrology, electronics, vacuum, mechanical engineering, simulations codes, detectors, and so on. In order to get more informations and/or discuss possible new experiments, measurements or ideas, please feel free to contact us.